Over the past decade few industries have evolved quite as rapidly and dramatically as it has in the world of security. The proliferation of new technologies and increasingly sophisticated crime has meant security providers have had to adapt quickly in order to keep up pace with new and emerging threats. We have seen many firms attempting to embrace the changes as demand has grown. One of the most highly visible industry trends over the last few years has been the shift from man power solutions towards integrated risk-based solutions. Security providers began the migration towards the risk-based model after learning they were able to quickly identify the true risks to an organisation and direct spending to where mattered the most. However, many of the latest innovations and developments in the sector only address a small element of a real Total Security Solution provider. More recently, security providers have increasingly placed greater emphasis on issues such as close protection, screening and vetting, infiltration and other specialist services as they look to expand and develop their service base. Evidence also suggests that internal fraud and theft have grown significantly over the past few years, which has led many employers across the UK to seek out new and more advanced forms of security protection. A recent report from BDO suggested that the UK loses more than £85.3 billion a year due to fraudulent activity, whilst the Association of Business Crime Partnerships, a body dedicated to reducing crime on businesses, estimates that a third of those losses can be attributed to staff theft and fraud. Additionally, the Centre for Retail Research estimates that British retailers lose some £1.5 billion a year to staff theft. Many security providers have responded to these trends accordingly, developing a whole new range of products and services for a growing customer base. All of these changes, combined with the world’s increasingly complex risk profile and growing demand, has resulted in a boom in the industry. However, many bloggers and commentators fail to grasp what is truly occurring within the industry, focusing on positive aspects such as growth and new innovations. The changes have seen a lot of larger companies that do not specialise in security acquiring smaller niche security firms at an accelerating rate. Currently, half of the top security companies in the UK are owned by a Facilities Management parent company, with security being just one of their service lines. This can result in putting the firm and their customers at a disadvantage as they would have to diversify their expertise on multiple layers, forcing them to spread out their resources more thinly. A firm which specialises solely in security would have the concentrated expertise and infrastructure to more effectively address their client’s specific needs. Another worrying development has been the commodification of security provision and the marginalisation of the core benefits from a professional security unit. As the market drives demand for new security services and fresh approaches to risk mitigation, security providers need to fully understand all of the developments taking place within the industry. They should specialise by broadening the security services offered, bringing them together in a cohesive and planned approach. At The Shield Group, the key to our on-going success has been the young managers we are training within the business through our Management Development Centre. This has equipped them with the skills to enable them to discuss new, innovative solutions for our changing security needs. 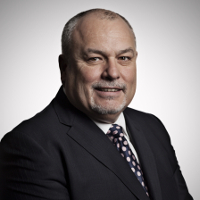 John Roddy is Chief Executive of The Shield Group which provides innovative, streamlined and specialist security services, implemented under a total security solution business model, to its customers nationally.